For the first time, I have set aside money monthly for our Christmas spending. In years past, we used a credit card to purchase our gifts and paid the card off in January. I’m looking forward to a stress-free January, because our gifts in 2013 will be paid for with cash as we buy them in November & December. Towards the end of September, I made a commitment to myself to write a series in October called, 31 Days to Find $1000. It has been a challenge in many ways this month. To begin with, I have never written every single day before. My posting schedule has always been 3-4 times a week–which is easier for me to maintain. And secondly, finding $1000 is not easy. But we have been more intentional with our spending and our savings and have questioned just about every purchase this month. Which brings me to Christmas! For my family, Christmas is the holiday to celebrate the birth of Jesus. The season has always been about faith, family, fellowship and food for us, but my husband and I also enjoy the gift giving aspect immensely–especially when it comes to our children. The Christmas shopping season is about to start. Stores will be open nonstop starting Thanksgiving Day. According to MSN, American families spend an average of $270 per child and most families also buy gifts for extended family members, teachers, service workers, and friends. We are trying to save $1000 and we’re about to head into the season where spending $1000 is very easy to do. 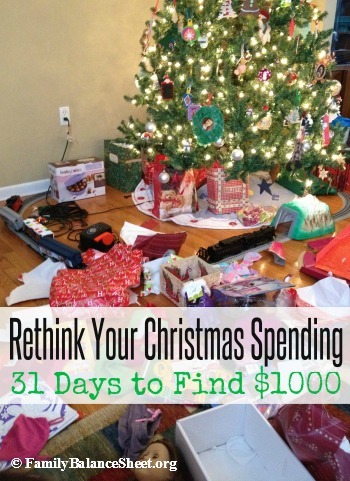 So the 31 Days to Find $1000 challenge today is to Rethink Our Christmas Spending. Take a look at your Christmas budget. (Request a Christmas Spending Budget excel sheet here.) Is it smart to spend all of that money on Christmas gifts if we must cash flow some needed expenses or have to put the gift purchases on a credit card? Let’s challenge ourselves to trim back our Christmas spending on gift giving and instead let’s focus on family, food, charitable giving, handmade gifts, gifts of time, and random acts of kindness. When I look back on my childhood Christmases, I do remember some memorable gifts, like the year my brother and I received the Atari game system (yes, I am that old) and the year our parents got us both skis and took us skiing on Christmas night. But my fondest memories are of family gatherings, the Christmas Eve candlelight church services, my grandmother’s silver Christmas decorations, and the cinnamon rolls my mom made on Christmas morning. Let’s make the season enjoyable and memorable without blowing our budgets. So what do you think? Can you trim back some of your Christmas spending? What will you do to make Christmas memorable, but not expensive? And for those of you following the Christmas Savings Club? How did you do in October to reach your savings goal? Let us know your plans in the comments. Check out my 31 Days to Find $1000 Pinterest board where I’ll be updating daily through out October.